Oven King provide a unique and intensive oven cleaning and valet service on all types of ovens, ranges, hobs, microwaves and BBQ’s. 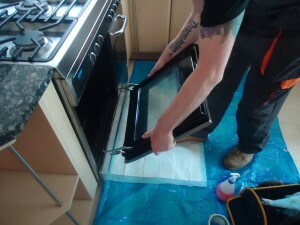 The process we use to clean your oven is above and beyond a standard spray and wipe down with our fully trained technicians utilising a vast assortment of professional cleaning tools making quick work of any burnt on grease and food deposits. 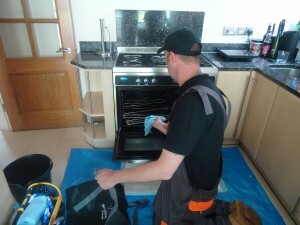 The cleaning process involves visiting your house at a time that suits you, our team of oven cleaning specialists are fully flexible and can visit your home outside of normal working hours including evenings, weekends and holidays. After introducing ourselves,our friendly staff will begin work on protecting your flooring and walls from any chemicals and equipment that may need to be brought into your home. This normally takes the form of a roll out carpet and flooring protector that covers the area in front of and around your oven. 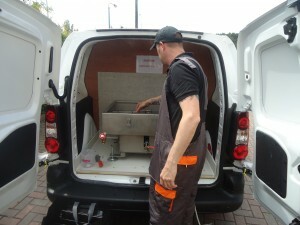 This is a standard precaution used throughout our unique oven cleaning and valet process, so means that we’ll have no problem bringing items into your home from our fully equipped service vans to begin bringing your oven up to scratch. 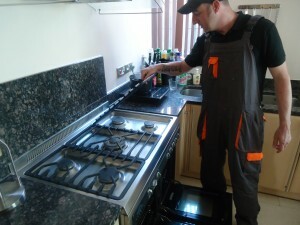 Our oven cleaning technicians are fully qualified to inspect your oven for any faults prior to working on your oven and if any are found are highlighted to you prior to working on your oven. This not only protects us from claims made against us for damages but gives you the opportunity to place an order on replacement parts such as bulbs and fans. After our pre-checks have been completed we bring both your oven and our purpose built dip tank to an operating temperature that helps with the cleaning process which normally takes around 20 minutes. During this time our oven cleaning technician wastes no time by stripping your oven of any removable parts such as doors, glass panels, interior fans, trays, grills and bulb cases ready to be cleaned. Once all items have been removed they are brought to the van and placed into the dip tank which has been primed with non-caustic products to begin work on stripping away all of the built up carbon deposits that reside on the various parts that were removed earlier. This process usually takes a further 30minutes so during this time our technicians get to work on the interior portions of your oven removing any rubber seals and side panels that allow access to the deepest recesses of your oven allowing for a level of deep oven cleaning that many non-professional cleaners miss. We have a large variety of fume free and non toxic products at hand to tackle all aspects of oven cleaning and depending on the severity of the cleaning job different strength cleaners are used to get the best results. If anything proves particularly difficult to remove we have industrial strength pastes designed to remove even the most stubborn dirt and grime, no cleaning job is too tough for Oven King to handle. 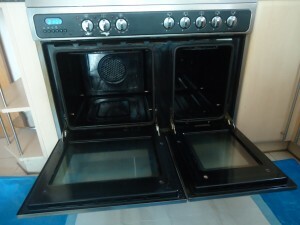 With care, consideration and a bit of elbow grease the internal components of your oven will be left in showroom condition in no time at all just in time for any parts cleaned in our specialist dip tank to be re-installed and in full working order ready for a final wipe down and inspection. At this stage our oven cleaning technicians will invite you into the kitchen to inspect their handy work and we are sure that you will be more than impressed. At this stage all of the precautions taken to protect your flooring will be removed and packed away back into our service vans and a bill for the work completed is produced. At this stage we would recommend pre-booking your next inspection and clean with us in some 6-9 months time and we look forward to seeing you again.